Moving house can be extremely stressful and tiring especially when trying to juggle work, the children and packing all at the same time. There are many tasks to fulfil from relocating bills, changing kids schools, cancelling the TV licence, noting the energy ratings, preparing the pets and more. So imagine the difficulty when instead of moving down the street you are moving to another country. Hiring an expert international removals company can really aid in the entire moving process. 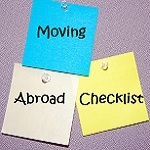 A dedicated moving manager can help with regards to setting up foreign bank accounts etc. so moving overseas is stress-free. They can assist in the packing, storage, shipping and insurance stages so you can be rest assured that your precious belongings are in super safe hands the entire time. And many removal companies run international divisions which focus purely on moving overseas so you can breathe easy and be confident in the knowledge that specialists are helping you move. There are varying issues you should contemplate depending on where you move be it within Europe, USA or Asia but a common top tip is six weeks prior to the move to check that your passport and visa is valid. Make sure all documentation is legally acceptable including any travel documents, tickets, medical records, birth certificates etc. In general, the people you need to contact include health providers such as doctor and dentist, insurance companies for the house, car and mobile phone, the bank, service suppliers including milkman, internet, vet, or newsagent, and all energy boards. Moreover, a top tip for moving to a foreign land is to understand the importance of respecting another country’s cultures, beliefs and laws. You need to know and obey their rules and regulations so it is best researching beforehand, so you don’t land yourself in any trouble or bother. Follow these simple guidelines from Robinsons and have a hassle and trauma free international move!